“We are overstretched and as we speak we are receiving more patients,” said Dr. Mohamed Dahir, who as a medical doctor in Somalia is struggling to cope with high levels of malnutrition. There is a massive influx of people into the region of Gedo in South Central Somalia where he works. They are fleeing drought. This has led to high levels of hunger in the area. The assistance available is not enough to keep up with the need. Drought and civil conflict have led to food crises across East Africa and in the Lake Chad Basin. Some areas such as parts of South Sudan are already experiencing famine. The humanitarian situation in Somalia is rapidly deteriorating. Spreading disease is complicating matters. Increased cases of Cholera combined with the famine is making Dr Dahir’s work more difficult. “Reduced access to water contributes indirectly to malnutrition by increasing the risk of infection and especially acute watery diarrhoea. 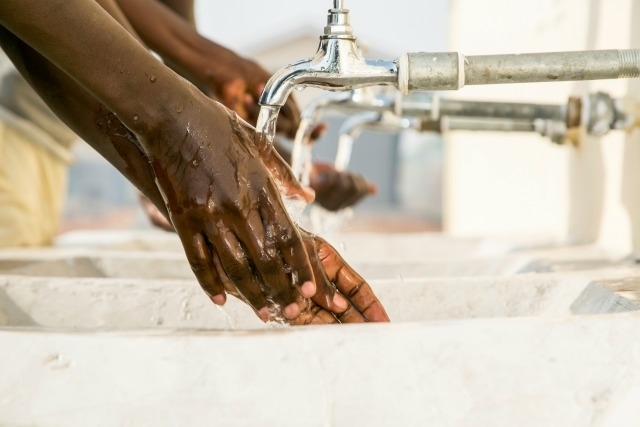 The current water stress reported in the region continues to increase the risk of Cholera outbreak spread,” he said. He works in Luuq Hospital, one of the medical facilities supported by Caritas in Gedo. The hospital provides basic primary health services, runs an in-patient department, including a stabilisation centre, and maternity services with a functional operation theatre for caesareans. 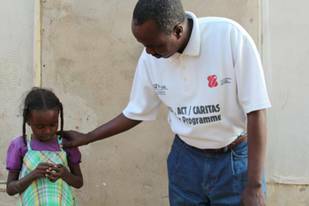 Caritas organisation Trócaire works across Gedo supporting seven facilities and three outreach health and nutrition programmes. Nutrition centres treat severely malnourished children, such as the health facility at Akara IDP Camp. It provides integrated health and life saving nutrition services. It’s one of Trócaire’s main primary health centres providing outpatient therapeutic and supplementary programme services. Mothers are streaming to the outpatient therapeutic centre, one of the few in Gedo. “In addition to the therapeutic feeds, we are also providing UNIMIX a corn soy blend flour to the affected families,” said Mary Wamuyu, the Nutrition Coordinator. “We usually use it as a family protection ration. The plumpy nut is for the malnourished child, the UNIMIX is mainly for the other family members including the children who are not malnourished”. The idea is to prevent the sharing of plumpy nut for malnourished children with those who are not malnourished and also to prevent those not malnourished from becoming malnourished. It’s fortified with micronutrients which are often missing in the children’s normal diet. “The famines we’re seeing here in Kenya and Somalia are truly weather related. They’re not caused by the political conflict that we see in the other countries,” said Lane Bunkers, a Nairobi-based Catholic Relief Services official responsible for the agency’s efforts in Kenya and Somalia. In South Sudan, where famine has been declared in parts of the country, CRS communications officer Nancy McNally writes that the crisis is a man-made disaster. Even before the most recent conflict, less than half of all South Sudanese had access to safe drinking water. And only 1 in 10 people has access to sanitation, in many cases a pit latrine. Cholera, an often-fatal disease—especially among weak, hungry people—was first detected in the capital, Juba, in June 2016. More than 5,000 cases have been found across the country since, all in areas with high concentrations of people living in camps for the displaced. The camps have limited health services and hygiene. More than 100 people have died of cholera, in addition to those who have died from famine, which has been declared in two counties. Famine could affect much wider swaths of the country by the peak of the lean season in June and July. 100,000 people are facing an imminent risk of death from hunger unless there is an immediate response of emergency food and water to the worst-hit zones. In a few months, 5.5 million people—or nearly half the country—will be struggling to survive extreme hunger. Weakened by lack of nutrition, they will be more vulnerable to opportunistic diseases like cholera. Although there has been a drought, it hasn’t been nearly as bad as in other countries in East Africa. But in South Sudan, lack of security prevents people from planting any crops. With the renewed violence, many students left St. Kizito Primary School in Juba last year. But other students displaced to Juba arrived. Catholic Relief Services quickly refurbished existing pit latrines, built latrines specifically for girls, and added more latrines to accommodate teachers and students. CRS also drilled a borehole so the school now has access to clean water. Hand-washing stations were set up near the latrines and at the entry to the school canteen. “When we first came here, the school was having water brought in by trucks,” said Willie Kiarie, education program manager for CRS South Sudan. “Those trucks bring in two types of water: treated and untreated, but it’s hard to know which is which. Some of the water comes straight from the Nile, meaning people can get any number of sicknesses,” he said. Six Catholic schools besides St. Kizito are benefiting from similar infrastructure improvements and hygiene education. “Even though we’ve only been working a short time, we can already see a clear trend that cases of illness, such as diarrhoea and typhoid, are going down,” said James Okello, CRS hygiene promotion officer for the Catholic schools project funded by Latter-day Saint Charities. He says that cases of malaria should also decline, since mosquitoes are attracted to dirty latrines. At St. Kizito, the programme also supported creation of a school health club, a 20-member group elected by the school. Members share lessons on hygiene at school and at home with family members, including younger siblings. This helps maximise the benefits of our hygiene promotion activities in schools. Clara Esther Peter, a health club member, says she sees positive changes at home. “It might be small things, but important things,” she said. “We always have soap at home now to wash our hands, but before we didn’t think it was so important.” She says her family appreciates knowing ways to protect themselves from sickness.